Fact: It is difficult, but not impossible, to alleviate traffic congestion in cities that have built a lot of roads. But even if public transport doesn’t quite achieve the ‘gold standard’ of reducing congestion, its real importance is that it allows people to get around without adding to congestion, and ideally without sitting in traffic at all. It has long been understood that building roads doesn’t reduce congestion, because the new roads quickly breed their own traffic. The Downs-Thomson paradox asserts that when the quality of road travel improves at the expense of alternative modes of travel, people flock to roads until congestion is as bad or worse than before. An important contributor to this process is that when people find road travel more attractive, they abandon their use of alternative modes, doing these trips by car instead. We have as evidence the collapse in public transport use in Melbourne during the 1960s and 1970s, to around one-third of its immediate postwar level. Declines in use of individual public transport services have also been seen following the opening of parallel roads, such as on the Glen Waverley line following the completion of the Monash Freeway and CityLink. Logically, this should also be true in reverse. That is, improving the quality of public transport relative to that of car travel should lead people to switch from driving to taking public transport, making more room on the roads. Could this actually lead to a reduction in traffic congestion? This is not a simple question to answer. If people shift from cars to public transport, the effect is the same as from building a new road: it frees up road capacity, so people respond by driving more. So to a large extent, the traffic shifted to public transport will just be replaced by new traffic. This is also known as the ‘Lewis-Mogridge position’ or the ‘Mogridge Conjecture’: traffic always expands to fill the available road space. 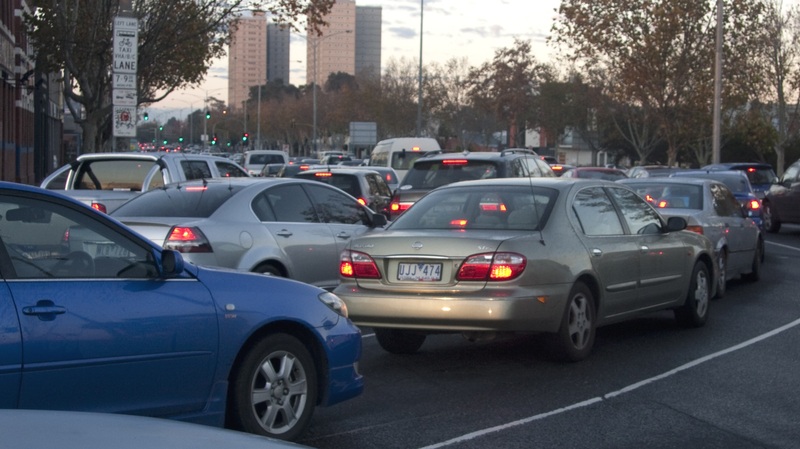 Many transport planners have concluded that public transport improvements simply cannot reduce road congestion, for this reason. One piece of ‘evidence’ frequently cited is a 2009 study by econometricians Gilles Duranton and Matthew Turner, The Fundamental Law of Road Congestion: Evidence from US cities . This study confirmed the near-perfect correlation between the amount of road space and the volume of traffic. But it also claimed that the provision of public transport has no discernible effect on road traffic volumes or congestion. In fact, their paper found no such thing. This is because Duranton and Turner chose to define ‘amount of transit service’ as ‘size of the peak bus or train fleet’. This is a readily available statistic for the US cities studied, but it bears little relation either to the quality of public transport service or to actual public transport patronage in these cities. Many US cities, for example, operate large fleets of ‘commuter‘ buses that run only in the morning and evening peak hours. Even where off-peak service is provided, it’s usually so poor that public transport can only ever have a marginal role in these cities, no matter how much service is provided for peak-hour commuters to the downtown area. And because the study considers only US cities, there are simply too few cases of comprehensive, high quality public transport service – the sort that genuinely competes with car travel – to provide a statistically meaningful result. So the question remains: should we expect congestion to always maintain the same level, regardless of what alternatives to car travel are provided? Economist Anthony Downs (of the Downs-Thomson paradox) is best known for describing this as an ‘equilibrium’ process. Basically, people sort themselves onto one mode or the other until the level of ‘inconvenience’ equalises for both. Since car travel gets slower the more people drive, and public transport gets more crowded with increasing patronage, there’s an ‘optimum’ level where no traveller will improve their journey by changing mode. The key insight, which was further developed by J. Michael Thomson in his book Great Cities And Their Traffic , is that this ‘optimum’ level will itself change due to transport policy decisions, and not always in the way people expect. This is the real message of the Downs-Thomson paradox – that ‘improving’ roads can leave things not just as bad as before, but worse. Suppose a new road is built and gains traffic at the expense of public transport. In this case, falling patronage on public transport has a further consequence: transport operators will generally respond by reducing the level of service. (Indeed, this is what happened on the Glen Waverley line in the 1990s.) The result is that travellers will suffer more inconvenience on public transport – and will therefore tolerate more congestion on the new road than they otherwise would have. This is the classic ‘lose-lose’ outcome that results all too often from short-term thinking. The Germans call it Schlimmbesserung – an improvement that makes things worse. Economist John Odgers invoked this same word in a 2009 paper that identified a travel time ‘dis-saving’ to motorists from CityLink, that came about for the reasons just given. Now consider the reverse: an improvement to public transport service. By making public transport more convenient, this will lead some people to choose public transport instead of driving the car. Patronage on the improved public transport service will increase. If the public transport service was little used before now, it will be able to absorb significant extra patronage before overcrowding becomes a problem. Passengers will keep finding public transport more convenient, even at the higher level of patronage. People will therefore (if acting rationally) only tolerate the road alternative if the inconvenience reduces for that mode as well. It’s therefore likely that a new ‘equilibrium’ will come about, with more people using public transport and less congestion on parallel roads. If the public transport service was already well used, the increased patronage risks overcrowding the service. A good, well-supported operator will respond by scheduling even more services. If service provision stays ahead of overcrowding in this way, passengers will continue to enjoy a reasonable level of convenience much as in the first case, and will be less willing to endure heavy road congestion as an alternative. So in this case there is also a good chance of congestion relief. If the increased patronage results in overcrowding, and the operator cannot or will not respond with additional services, then passengers suffer increased inconvenience as more shift to public transport. In this case, while there are more passengers being carried, there is no supplementary benefit in passenger convenience or reduced travel times. Likewise there is no change in people’s expected tolerance of traffic congestion. Thus congestion in this case will return to its previous level, or even get slightly worse. So it is theoretically possible for public transport improvements to reduce road congestion, but it requires quite special conditions – in particular, a political willingness to continue investing in more public transport expansion as patronage grows, and not to be tempted to add new road capacity at the same time. Crucially, transport investment must also stay ahead of other factors like population and economic growth that increase the demand for travel. Needless to say, these are conditions that are difficult to satisfy in reality. Even Vancouver, which has avoided building urban motorways for 40 years and has invested substantially in public transport, has not seen any great decline in traffic congestion. This is because Vancouver has become so successful as an attractive place to live that it has undergone a long population and employment boom that has placed huge demands on its transport system. We are only starting to obtain reliable evidence from cities that are making serious public transport improvements and have both relatively stable populations and reliable measures of traffic congestion. Simply comparing traffic speeds between peak and off-peak conditions, as the oft-cited TomTom index does, gives a misleading picture, as others have explained. A somewhat better measure for this purpose is the Urban Mobility Index produced by Here Technologies, which combines a speed comparison with measures of actual travel delay and the percentage of congested roads in an urban area. Interestingly, the latter lists as the best cities for ‘Traffic Flow’ those like Helsinki, Zurich and Madrid that have particularly well-developed alternatives to car travel. In the meantime, though, we should realise it doesn’t matter so much even if public transport improvements don’t reduce traffic congestion. They are still fulfilling their primary purpose of allowing people to get around and carry out their daily activities without adding further to congestion – and if public transport is of sufficiently high quality, without getting tangled up in congestion at all.